So, you may have noticed that I'm a fan of music, and you may have further noticed that I'm a fan of music delivery services that don't try to "enhance" my experience with digital restriction management schemes (a.k.a. DRM). For that reason, I've been subscribing to Emusic for a while. Emusic is cool and has wonderful selection and gets new stuff all the time, but it doesn't have everything, especially independent artists. Well, I just found out some fantastic news the other day. CD Baby (my favorite retailer of independent music) has started to sell MP3s of the albums that they sell! Along with the CDs they have for sale, they sell the album ripped as a series of high quality MP3 files in one big archive. The really interesting bit is that CD Baby is being very upfront about how they money from the MP3 downloads gets distributed to the artists: 91% to the artists and 9% to CD Baby (more details here). I assume that serves two purposes. One, artists potentially wanting to sell their content through CD Baby will know the deal right up front. Two, customers (like myself) can tell exactly how much of the money they're spending is getting to the artists. That second is very important to me. I like knowing that I'm directly financing the artists whose work I enjoy. 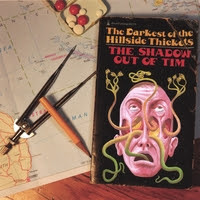 At the same time I heard about CD Baby's foray into MP3 sales, I found out that my favorite Lovecraftian band Darkest of the Hillside Thickets have released a new album on CD Baby called The Shadow Out Of Tim. So, I decided to give the MP3 purchase a shot. All I can say is that it worked as advertised, and I have absolutely no complaints (oh yeah, I'm enjoying the music too). The nice thing about MP3 downloads is that you get instant gratification (or delayed instant gratification in my case since I only have 256k DSL). No waiting for a CD to ship. The only thing that may turn people off from CD Baby's MP3s is that they've decided to sell the entire albums in one archive. You can't pick individual songs. For me, that's fine. I tend to pick up entire albums anyway. I download the occasional single from Emusic, but most of the time when I find a new artist that interests me, I just grab their whole album. I give the artist plenty of opportunities to woo me. If CD Baby didn't offer the MP3s, I'd just end up buying the CDs anyway. Support the musicians, man! Anyway, I haven't said much about Darkest of the Hillside Thickets, but if your curiosity is piqued, I'd suggest starting with their Spaceship Zero album (you can play some samples by clicking the little play buttons). It's cheaper than their latest, and I've spent a lot of time listening to it. It's my favorite album from them and full of examples of nerd rock at its finest. So, if you've got a spare ten bucks burning a hole in your pocket, give it a try. If you don't support nerd rock, who will? I found out about the CD Baby news via a post from Jonathan Coulton. Mr. Coulton is a musician in his own right. Feel free to check out some of his stuff. His listening suggestions are a good place to start.